In our system we have the most robust Domain Management system in the business. We offer a "one size fits all" solution from FREE domains and subdomains to custom domains for as little as $9.99 per domain that you can use for all of your Personal and Property Marketing. 1. Buy whatever domains you like that are available! Let's start with the best solution which involves buying as many domains as you like and making them work for your Personal Websites and Property Websites. From our Domain Management page in the system you can buy whatever domain you like that is available for as little as $9.99. After you checkout you may then pick which Personal Website you want it to be used for. Just choose the domain and then the Personal Website you want it to work for from the dropdown of different selections based on what you've added to the system. You can have Websites for every niche, neighborhood or brand that you promote. You may also choose to use the domain as the main domain for all subdomains on your Property Websites. For instance www.ChrisBatesHomes.com can be use for that Agents Personal Webite and ALL their properties with a subdomain pre-fix...like www.TestSally.com http://249Ruby.ChrisBatesHomes.com. 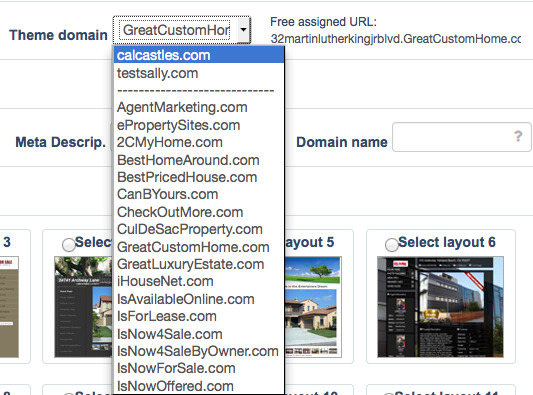 It will become one of the top domains on the list to choose for your listings. Have a domain that matches different brands, niches, property types....etc. Address Specific Domains can be purchased directly from our buy screen on any listing and it will work automatically for that listing. That can greatly help branding efforts. If you want to attract more prospects, here is a post about using Address Specific Marketing. Use any of our FREE domains for your Property Websites or our ValuedAgent.com for your personal website like TestSally.ValuedAgent.com. We have over two dozen to choose from and you can have whatever you wish (usually the property address (dot) one of ours). For instance 129View.GreatCustomHome.com.